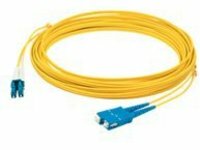 This is a 65m single-mode fiber (SMF) duplex SC/LC OS1 yellow patch cable. This high quality SMF (9/125) patch cable is specifically designed for Ethernet, multimedia, or communication applications, and is intended for use with 10Gb applications. This patch cable is suited for LANs or SANs, and is recommended for connection between fiber patch panels, hubs, switches, media converters and routers, etc.